"Give blood. All you'll feel is good." As this slogan from an American Red Cross campaign illustrates, giving is good for both the recipient and the donor. Psychologists have conducted experiments to determine if this Red Cross claim is true -- and it turns out that this is one slogan that passes the truth-in-advertising test. People reported experiencing increased moods before and after they donated blood. We often get a sense of joy from giving a meaningful gift to a loved one, but perhaps no gift is as valuable as our time. At the highest end of the Community Well-Being continuum is giving back to society. This may be what differentiates an exceptional life from a good one. When we asked people with thriving well-being about the greatest contribution they had made in their life, with few exceptions, they mentioned the impact they have had on another person, group, or community. Not only had these individuals made a substantial contribution to something bigger than themselves, but they also had been recognized for their community involvement. As our research on Financial Well-Being revealed, donating money results in a greater return for our well-being than buying material goods for ourselves. Neuroscientists have discovered that the regions of the brain that are activated when we receive money (based on fMRI brain scans) glow even brighter when we give money. According to Jordan Grafman, a neuroscientist at the National Institutes of Health, these reactions in the brain "help us plan into the future, feel emotionally closer to others, and give us a sense of reward after a behavior -- which reinforces that behavior, making it more likely we will do the same thing again." We often get a sense of joy from giving a meaningful gift to a loved one, but perhaps no gift is as valuable as our time. This might explain why some volunteers get a "helper's high" -- they feel stronger, more energetic, and more motivated after helping others even in the smallest ways. When we surveyed more than 23,000 people on this topic, nearly 9 in 10 reported "getting an emotional boost" from doing kind things for other people. When we do things for others, we see how we can make a difference, and this gives us confidence in our own ability to create change. Throughout the course of our lives, well-doing promotes deeper social interaction, enhanced meaning and purpose, and a more active lifestyle -- while keeping us from being too preoccupied with ourselves or getting into harmful emotional states. Several studies have shown a link between altruistic behavior and increases in overall longevity, and researchers have speculated that this might be due in part to how well-doing inoculates us against stress and negative emotions. When presented with two choices, we tend to select the default option. Even in the case of something as significant as donating your organs, your decision is heavily influenced by whether the system is set up to opt you in or to opt you out. The basic structure of a form, a pre-filled check box, or an automatic enrollment process shapes our decisions a lot more than we realize. For example, in countries where citizens are automatically enrolled to donate their organs as the default, the vast majority choose to do so. 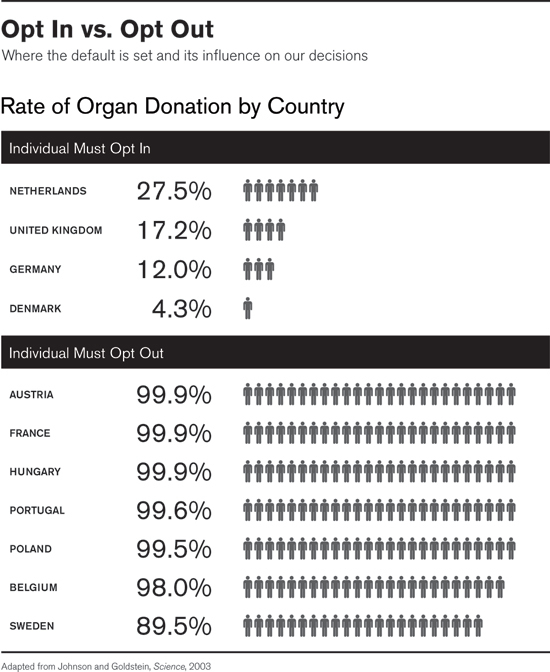 However, when citizens are not automatically enrolled, very few choose to donate their organs. Where this default option is set might even determine whether millions live or die each year. In China, for example, more than 1 million people are reported to be in need of organ donations, yet only 1% actually receive the transplant surgery they need. Because of the nation's organ shortage, four in five people die while waiting for a transplant. The rate of organ donation in China is a mere one-third of one percent. But if every Chinese citizen were opted in to organ donation, the supply could exceed the need. For the most part, we can set our own defaults -- for everything from organ donation to savings plans. But it does require some effort. So we often sit back and let life happen over the course of years and decades. But people with thriving Community Well-Being find novel ways to opt in to regular donations and volunteering. People with high Community Well-Being make their interests known to friends, colleagues, and family members. One man we interviewed told us he volunteers at organizations that he knows will make specific requests of his time every month, much like a part-time job. One woman holds herself accountable for at least five hours of volunteering per month. Several people described how they give a fixed amount each year or a fixed percentage of their income to community groups. Some organizational leaders make it easy for employees to have regular contributions deducted directly from their paycheck. Progressive workplaces offer matching company funds for each dollar contributed by their employees. While the ways in which individuals and organizations do so vary, they all establish some kind of mechanism to hold themselves accountable for sustained community involvement. Giving back to the community does not have to be a purely altruistic act. People who make profound contributions to community organizations usually have an emotional tie to the organization's mission or cause. People get involved because of a parent with a degenerative disease, a friend with cancer, a child with autism, or some other deeply personal connection -- it is these connections that spark their interest in the first place. Those with a vested interest actually have more to offer because of all their knowledge and personal mission. People with high Community Well-Being make their interests known to friends, colleagues, and family members. Then when the right opportunity presents itself, they are more likely to be called upon, and they get involved. Because this often occurs in the context of a workplace or a religious organization, these are good forums for telling others about your interests. Ertel, K.A., Glymour, M.M., & Berkman, L.F. (2008). Effects of social integration on preserving memory function in a nationally representative US elderly population. American Journal of Public Health, 98(7), 1215-1220. Johnson, E.J., & Goldstein, D. (2003, November 21). Do defaults save lives? Science, 302, 1338-1339. Johnson, M.K., Beebe, T., Mortimer, J.T., & Snyder, M. (1998). Volunteerism in adolescence: A process perspective. Journal of Research on Adolescence, 8(3), 309-332. Piliavin, J.A. (2003). Doing well by doing good: Benefits for the benefactor. In C.L.M. Keyes & J. Haidt (Eds. ), Flourishing: Positive psychology and the life well-lived (pp. 227-247). Washington, D.C.: American Psychological Association. Putnam, R.D. (2000). Bowling alone. New York: Simon & Schuster. Stoddard, G. (2009, July/August). What we get from giving. Men's Health, 24(6), 108-115. Tom Rath is the author of the bestsellers How Full Is Your Bucket?, StrengthsFinder 2.0, Strengths Based Leadership, and Wellbeing: The Five Essential Elements. Jim Harter, Ph.D., is Chief Scientist, Workplace Management and Wellbeing for Gallup's workplace management practice. 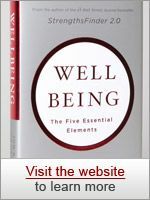 He is coauthor of the New York Times bestsellers 12: The Elements of Great Managing and Wellbeing: The Five Essential Elements. His research is featured in First, Break All the Rules, and he contributed the foreword to Gallup's new edition of this groundbreaking bestseller. In partnership with leading economists, psychologists, and other acclaimed scientists, Gallup has been exploring the common aspects of well-being that transcend countries and cultures. Researchers uncovered five essential elements that differentiate a thriving life from one spent suffering. Companies can't afford to wait around while Washington debates various plans to reduce healthcare costs. And they don't have to, according to two executives. Organizations have plenty of options at their disposal to stem rising costs and instill healthier employee lifestyles right now.